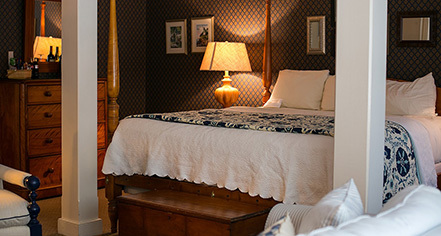 The Bedford Village Inn offers 14 elegantly decorated guest suites. 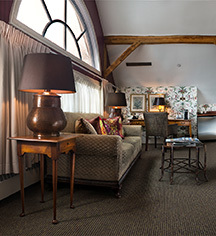 Not one room is alike and each, both meticulously and beautifully, decorated. Pick one as a favorite or try all fourteen to help decide. The Restaurant is a very short walk to breakfast on the Porch dining room, lunch in the Patio surrounded by gardens, and an elegant dinner at a choice of three very unique restaurants, the Tavern, Corks Wine Bar, or Dining Room. After over-indulging in any of the deliciously satisfying dining options, enjoy a warm deserving soak in the hot tub at the Grand, followed by a night cap in the Lobby Bar.